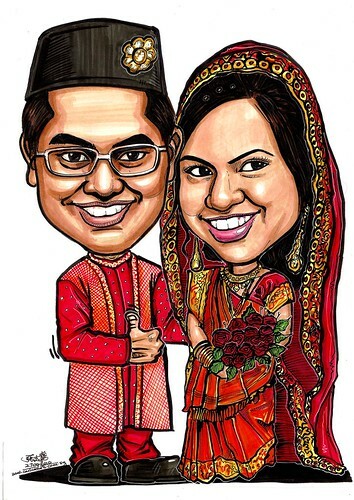 ".....I would like to order caricature marker. Its like the post on your blog on 18 March 2010, but this is a indian muslim way. So I will show different kind of photos and explain along the way. Cause they do not have a photo taken together nor the studio photos. So its quite difficult. I have attached powerpoint slides with the explanation beside it....."
The remaining brief is mainly mix this to match that type, which is the tougher part, on top of the wedding costume details. I spent about 2-3 times longer on these details, as compared to thefaces.